Small business owners know that employees are their most valuable resource. Small business owners work hard to train and retain employees by creating a rewarding workplace. However, government mandates and regulations have made labor issues more complicated than ever. Small businesses operate differently than large businesses; they do not have human-resources departments to track the changing standards and rules that affect their workforce and workplace. 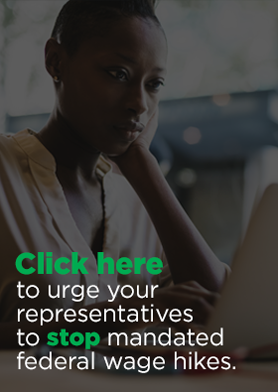 NFIB urges Congress to simplify the employment process for small business, eliminate burdensome mandates, and prevent cumbersome regulations that inhibit job creation. Small business owners know that more than doubling the federal minimum wage will lead to increased labor costs and tough choices. They must either increase the cost of their product or service or reduce labor costs elsewhere. The reduction in labor costs would be achieved through reduced jobs, reduced hours, or reduced benefits. NFIB opposes the Raise the Wage Act because 92 percent of NFIB members opposed an increase in the federal minimum wage to $15.00 per hour by 2024 and annual increases in subsequent years in a recent member ballot. NFIB supports eliminating the Federal Unemployment Tax (FUTA) “surtax,” lowering the FUTA tax and returning the unemployment insurance system to the states. NFIB supports the Trump Administration’s proposed rule that would return the Department of Labor’s “Joint-Employer” standard to its pre-Obama Administration definition. An employer should not be responsible for the subcontractors hiring-practices. Click here to read NFIB’s comments on the Department of Labor’s proposed rule. 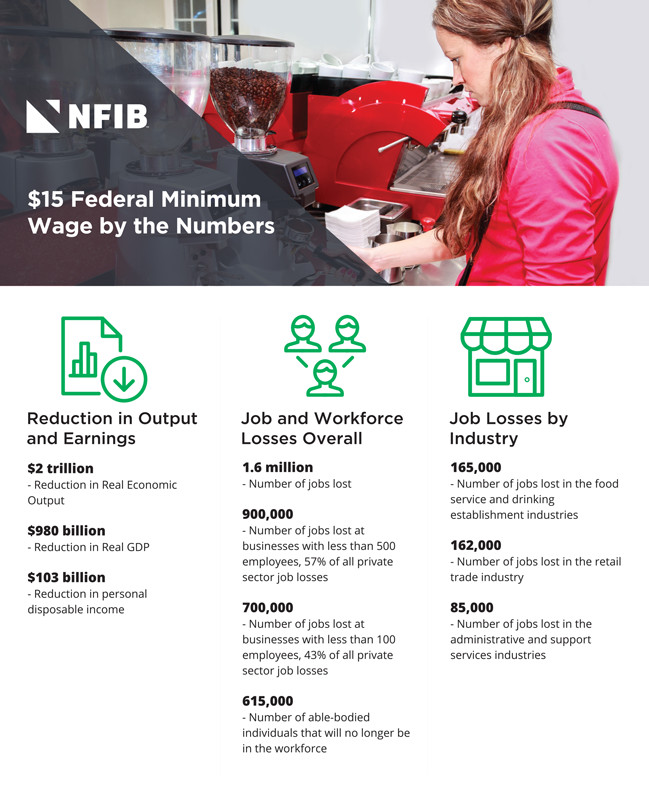 Our infographic below details how the $15 Federal Minimum Wage impacts small business.